(Bloomberg Opinion) -- What qualifications are required to set U.S. monetary policy? For the seven spots on the Federal Reserve’s Board of Governors, the main hurdles are that you can’t simultaneously work at or hold stock in a Fed member bank, be a U.S. senator or member of the House of Representatives, already have served a full 14-year term, or hail from the same Federal Reserve district as another member. One of the governors also has to have “primary experience working in or supervising community banks having less than $10,000,000,000 in total assets.” Oh, and the president has to appoint you and the Senate confirm you. 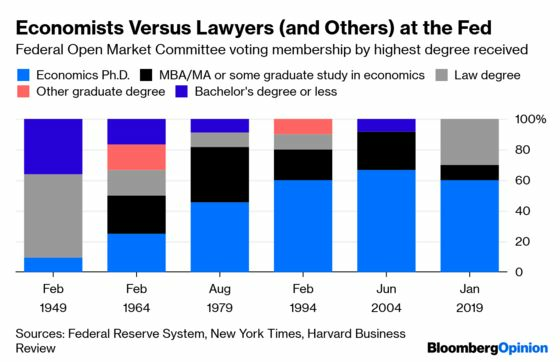 There’s nothing in there about needing a Ph.D. in economics, but in recent decades most members of the FOMC have had them. Some have come from academia, others from long careers in the Federal Reserve System, and a few, such as former Fed chairman Alan Greenspan and former Federal Reserve Bank of New York president (and current Bloomberg Opinion contributor) William Dudley, from private-sector backgrounds. Still, even economics Ph.D.s have a pretty tenuous grasp on key concepts such as the non-accelerating inflation rate of unemployment; plus, the whole point of assigning key decisions to a group is to make room for a diversity of backgrounds and opinions. Effectively restricting Supreme Court membership to appellate judges who have graduated from one of three law schools sure doesn’t seem to have improved the quality of its decision-making, and it may be eroding its legitimacy. President Donald Trump’s Fed appointments so far have represented a modest shift away from rule-by-economists. Chairman Jerome Powell and Vice Chairman for Supervision Randal Quarles are both lawyers with a mix of government and private-sector experience. Trump also nominated two economics Ph.D.s with Fed backgrounds, but the Republican Senate never got around to confirming either. Now, of course, he has made known that he wants to nominate Stephen Moore, who has a master’s degree in economics but is known mainly for his political activism — he co-founded and was first president of the Club for Growth, which pushes, often successfully, to elect anti-tax candidates, and was a Trump adviser in the 2016 campaign — and his punditry. Moore’s punditry, it must be said, gets some pretty dire reviews, even from people who share many of his political views. He “does not have the intellectual gravitas for this important job,” prominent Republican economist N. Gregory Mankiw opined. “The consensus in conservative academic think tank land is that Moore is an enormous hack,” conservative New York Times columnist Ross Douthat wrote on Twitter. I have followed Moore’s opinion journalism on taxes for many years and have been similarly unimpressed. His less voluminous output on monetary policy seems, if anything, even worse. On taxes, Moore has espoused the consistent and often correct view that cutting them can bring higher economic growth; the problem is that the arguments and data he marshals to support this view are often dodgy. On monetary policy, Moore’s factual claims have been at least as unreliable — the Cato Institute’s George Selgin and the Washington Post’s Catherine Rampell both have detailed accounts of his bizarre (and false) claim that former Federal Reserve chairman Paul Volcker swore by a “Volcker rule” of targeting commodity prices at the Fed — and he also has no coherent ideology, seeming instead to favor tight money when a Democrat is in the White House and easy money when a Republican is. Not just an enormous hack, then, but a transparently partisan hack. Still, nothing in the law says transparently partisan hacks can’t be appointed to the Federal Reserve Board. Congress structured the Fed to give presidents and senators great influence over it, but also limited that influence with the local appointment of Federal Reserve Bank presidents and the staggered, long-term nature of Fed governorship appointments. The fact that hardly anybody finds being a Fed governor enthralling or prestigious or remunerative enough to stick around for a full 14-year term does make it easier to pack the board than was intended, and one of these days Congress should address that. But in the meantime, a president gets to appoint people he or she wants to the Fed, and the Senate to confirm them if it sees fit. If Moore’s economic thinking really is as unsophisticated as he makes it out to be on cable television and in newspaper op-eds, he will likely have not just zero but also probably negative influence on his fellow Federal Reserve Board and FOMC members, and Trump will have wasted an appointment. This does seem like something that senators, especially the Republican ones, should consider if and when they’re called on to confirm him. That Moore is not an economics Ph.D. and hasn’t followed a conventional path to the Fed — a recurrent theme in much of the criticism that has greeted Trump’s announcement — really shouldn’t disqualify him, though. In fact, it should probably weigh a little bit in his favor.